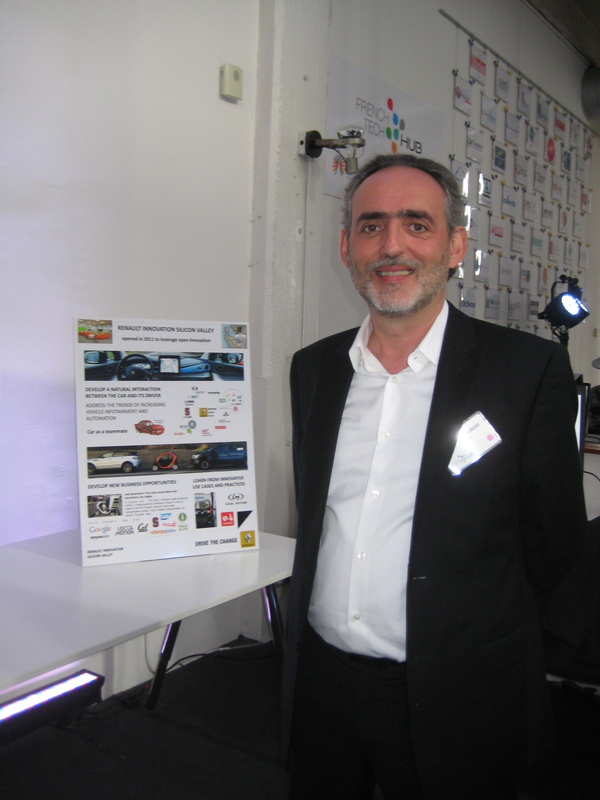 Interview: Serge Passolunghi ” Run Fast” at Renault in Silicon Valley! Serge Passolunghi is Director of the Renault Office in Silicon Valley. We had the opportunity to sit down with him and get his insights about Open Innovation for a French company in Silicon Valley. – Can you tell us about the activities of Renault in the US? Renault is a French company that sells cars in 130 countries except in the US and Canada. However, Renault decided to open an office in Silicon Valley in 2011, convinced for years that it was necessary to be part of its ecosystem to foster innovation and get advantage of its pioneer spirit. Located in Sunnyvale, and shared with Nissan , we are a lean team reporting to the R&AE Department at Guyancourt in France . We focus on innovations in the connected car domain. – With regards to innovation, what are the trends that you see in Silicon Valley in the automotive sector? 1. “Internet of Things”: The Consumer Electronic Show in Las Vegas this year could almost be renamed The Car Electronics Show. It was amazing to see how many cars were present, either by automotive companies or consumer electronics companies. As an example, the attraction at the Samsung booth was clearly the BMW i3 and its connexion with the Galaxy Gear smart watch. 2. “Quantified self”: This is a very dynamic movement around sensors that you wear and AI software that enable a lot a various insights. We consider these solutions to be adaptable to the car environment. It allows us to provide greater well-being and more fun in the car, rather than feeling “stuck” in it. All in all, as a user friendly company, our objective is to make these innovations easy to use for all our customers in a semaless user experience. – What do you think of Open Innovation and how do you implement it at Renault? 1. Open Innovation as a way to leverage the innovations from startups, universities, and laboratories. We are a small team of researchers and project managers, so we are very open to outsourcing and collaborations. 2. Cross- innovation: as a carmaker we are evolving from a B-to-C model to a business model in which we sell mobility and services. In fact innovation is at the crossroads between automakers like Renault, cities, and other companies in utilities. For example, one of the obstacles to the development of the electric vehicle is the availability of the network and charging stations. Innovations in our domain require a necessary cooperation across industries. – What do you bring to start-ups with whom you engage? Last year, we started five to six contracts with startups and university labs. We aim to double that number this year. Our active network is more than 50 potential partners. Renault funds these players to bring their innovations to match automotive industry needs. This is not the only way we work with startups. We have several examples of collaborative “win -win” projects with startups without any exchange of cash: we work together to adapt the technology to the environment of the car, startups bring their technology, and we bring our use-cases and our simulation facilities (at the Sunnyvale office). – Is there a typical startup profile that you like to partner with? We often work with incubators in the valley and we realized that while it is interesting to exchange with early-stage startups, it is more difficult to undertake concrete projects with them. It is the strength of Silicon Valley: you can share a lot of ideas. However, for concrete projects, startups must be stable both on the technology and the business-model sides. We also privilege local startups from Silicon Valley. We favor short projects (a few months maximum) and everyone benefits. We like pragmatic approaches. Since our challenge is to make innovations easy and pleasant to use, we often start by ” designing the User Experience”. – What are the challenges you face? It is not difficult to find innovations. They abound! But when you’re a small team, it is important to select and know what you are looking for. Considering that it is relatively easy to find innovative ideas and technologies in the Silicon Valley ecosystem, our opportunities lie in selecting those that could potentially lead to new valuable services for our customers and added value for our Brand. Our team focuses on driver monitoring and understanding. If out of ten innovations, I can transfer two of them to Renault engineering teams, I will be happy! “Run Fast”: in Silicon Valley, you never stop, it is extremely dynamic, and it’s going very fast. Things to learn from Silicon Valley for French companies are agility and the culture of risk and failure.